Field Kallop is an artist whose primary tool is gravity. 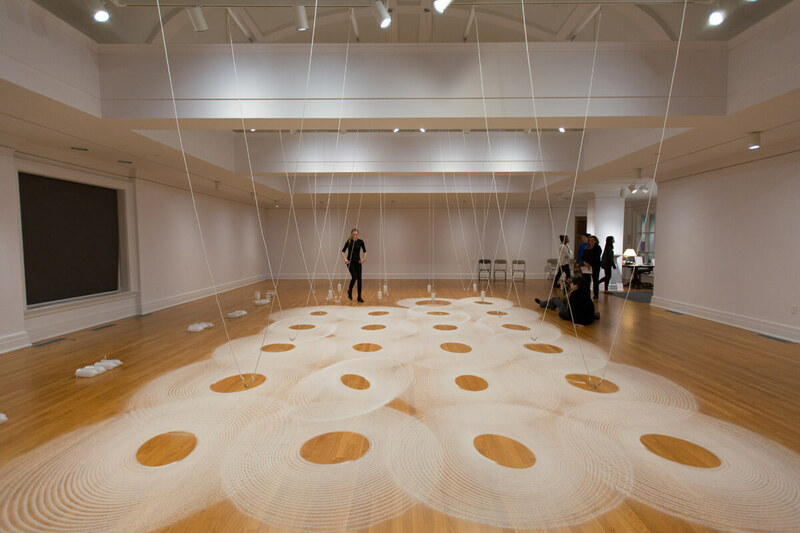 Her exhibition, The Melody of Structures, recently on view at The Tremaine Gallery, was an elegant contemplation of physics, mathematics, and the unseen structure of nature. 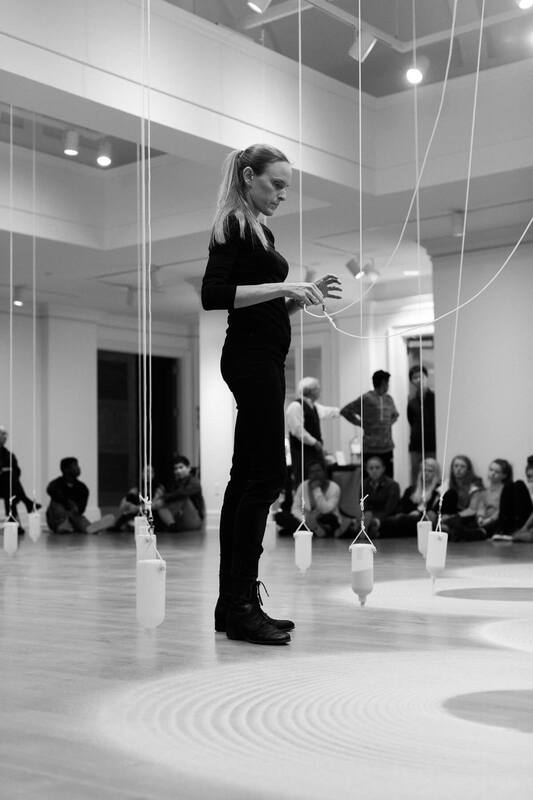 The work is hard to categorize because it is at once drawing, sculpture, installation, and, during a public event when she constructed the piece, performance. As approximately fifty observers stood around the periphery of the gallery, Kallop calmly presided over the space. A trained dancer, her spare movements were both graceful and functional, but her presence was not dramatic. She used her body as though it was one of her tools, an essential part of the process that is removed when the work is completed. Kallop’s stage was defined by a grid of twenty-eight directed overhead track lights. Twenty-eight evenly spaced lengths of cord hung from the rafters. Seven quartets of plastic bottles, and eight containers of sand sat in clusters at one edge of the space. Then Kallop methodically filled each bottle with a precise amount of sand, taped the orifice of each bottle, then attached each bottle to the end of one of the tethers. The sand’s weight rendered each vessel a pendulum. She systematically untaped each bottle, and using her arm as a fulcrum, she assessed the trajectory and released each bottle into a gentle elliptical orbit, causing sand to pour precisely onto the hardwood floor in delicate, ever-narrowing concentric ovoid rings. The slight thrust of Kallop’s arm and the inflection of her weight on the propulsion of the hanging bottle register as tiny erratica on the otherwise consistent pattern. She filled each vessel with the exact amount of sand needed to complete each individual “drawing” so that an empty area remained at the center of each ellipsis. The sand traceries left by each of the twenty-eight pendula overlapped at their outer edges, creating an overall pattern that was both constant and unexpected. When completed, The Melody of Structures graced most of the gallery’s floor. The finished work makes Kallop’s ongoing interest in metaphysics evident. Responding to both ancient traditions and contemporary genres that seek meaning through contemplation, The Melody of Structures is imbued with a meditative quality. The installation reflects Kallop’s study of aboriginal and Tibetan sand painting. The reiterated elliptical spiral forms suggest the vibrations of sound or the mathematical structures revealed by quantum science. Kallop has been influenced by the work of artists like Vija Celmens, Agnes Martin, and Sheila Hicks, who sought universal meaning in ephemeral details, repeated designs and minute substructures of the tangible world. As an MFA student at the Rhode Island School of Design, Kallop discovered the historic fabric industry of Providence. This seminal phase of her career is reflected in the overall design of the Tremaine piece, suggesting textile and rug patterns. One can also ascertain celestial references in The Melody of Structures alluding to the perpetual canvas of space that parallels subatomic strata. This is an exciting time in this young artist’s career. Her work is both thoughtful and assertive. It seems clear that we will see more of Field Kallop, an artist with a firm grasp of the big picture. The Big Picture first appeared on Happening in the Hills. Daphne Anderson Deeds is a fine art and museum consultant. She is seasoned art museum curator and administrator who has held senior positions at university and civic museums throughout the U.S., including the Yale University Art Gallery, and the Smart Museum of Art at the University of Chicago. Her eponymous consultancy serves museums, artist estates, private collectors and contemporary artists. Read more articles by Daphne Deeds. All original work attributed to Daphne Deeds © 2017 Daphne Deeds.